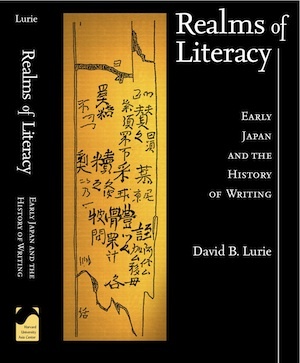 In arguing that logography plays a central role in the history of writing, in general and in East Asia in particular, Realms opposes what I see as an over-emphasis on phonography by a number of scholars and theorists of writing, most prominently John DeFrancis and J. Marshall Unger. Our contrasting approaches will be apparent to anyone who compares our work, but I should have provided more detail about their limited acknowledgement of logography. I do not believe that it is inaccurate to say that they claim that "all writing is necessarily phonographic" (p. 41) or that they insist "on the inherently phonographic nature of all writing" (p. 363), but they do not see all writing as exclusively phonographic. I should have mentioned that, in writings by Unger, by DeFrancis in the 1990s, and in co-authored essays, they repeatedly concede that actual historical writing systems do incorporate some degree of logography. We differ profoundly on the extent and significance of that incorporation, but it is not fair to imply that they deny its existence outright. I have a chapter entitled "The Development of Writing in Japan" in The Shape of Script: How and Why Writing Systems Change (ed. Stephen Houston, SAR Press, 2012). It summarizes several of the central arguments of Realms, especially those made in chapters 4 and 7. The correct title of Bender 2009 is "Performative Loci of the Imperial Edicts in Nara Japan, 749-70." I am more honored than I can say that Realms has been awarded the 37th annual Lionel Trilling Award for best book by a Columbia College faculty member.